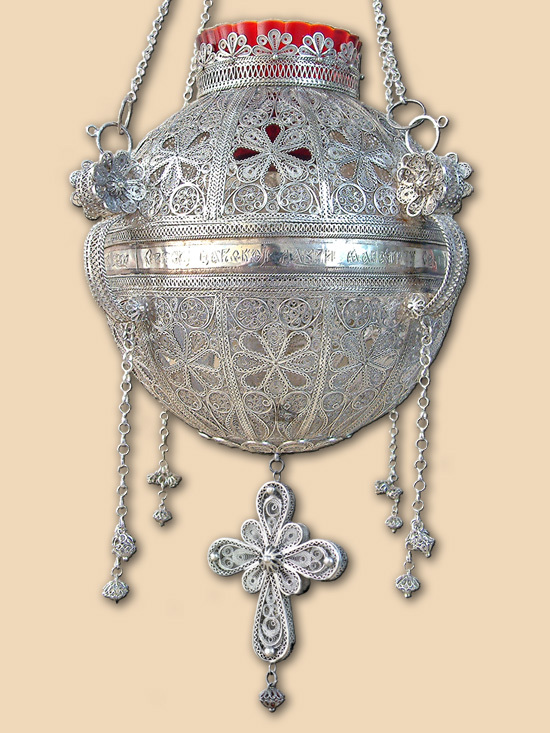 Altar silver filigree vigil lamp in spherical form with cross-shaped rosettes. The inspiration of the shape was derived from medieval crowns - stematoghirions of Serbian kings. These crowns were in form of a dome, abundantly decorated with precious stones and pearls. They had hanging chains - prependulias). Upper half of the lamp is made out of twelve parts with cross-shaped rosettes. The rim of the lamp has 12 floral elements. Bottom part of the lamp is similar to the upper half and has a solid silver circular plaque with signature of the master. It also has one double-sided hanging cross. The lamp is in pair with lamp KD016. 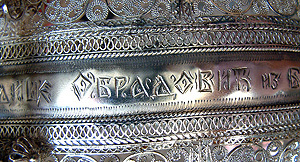 "Donated by Obradovic family from Belgrade to monastery holy Zica in 2007." "crafted by lord's servant, silversmith Goran Ristovic pokimica"
Vigil lamp was donated by Obradovic family in occurrence of celebration of 800 years of Zica monastery foundation. 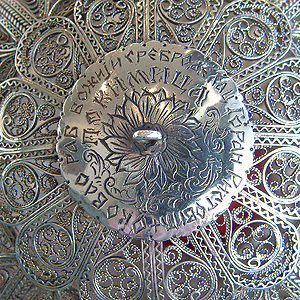 Technique: filigree, granulation, hand engraving (Lazic Radivoje, Kragujevac). Size: 17 (22) × 19 cm, chains 55 cm. Weight: Lamp 660 gr., chains with rosette 290 gr., cross 34 grams. Commissioned by: Obradovic family, Belgrade. In possession of: Zica monastery, Kraljevo.